Welcome to a new series of giveaways on my blog which will inspire you to get bookishly crafty! 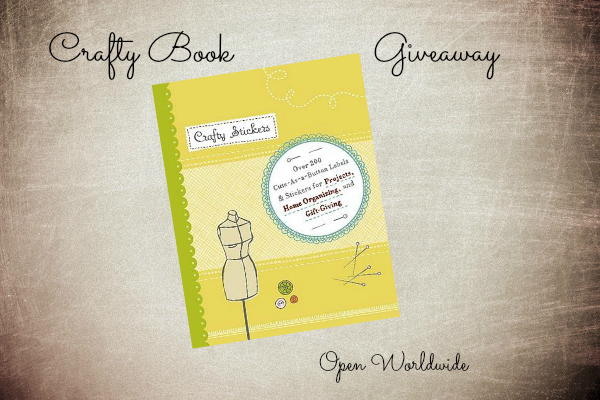 In this month's giveaway you can get your hands on a copy of Crafty Stickers by Catherine Head! This portfolio style booklet is filled with the cutest set of labels and stickers making it a perfect addition to any crafter's tool kit! All of the above! But mainly for organization and giftgiving/cardmaking. I use stickers mostly to label items I might have trouble identifying in the future. For instance, a baggie full of screws might only need a smiley face to tell me they were taken from a kid's desk. I use stickers for a lot of things, especially for gift giving and decorating envelopes/greeting cards! I use stickers for greeting cards and for scrapbooking. Thanks for the giveaway! Austrian Etsy ... spends time in the garden! Austrian Etsy ... needs a cup of coffee! Austrian Etsy ... sends you back to school!